“In his evidence-In-Chief, the Respondent explained that the gifts were made at a time of the marriage ceremony of his first daughter, Oremini Nkanu Onnoghen who got married sometime in 2015. It was not solicited and remains a part and parcel of the customs and traditions of the people. His Lordship tendered a copy of the wedding invitation which was admitted in evidence without objection by the petitioner as Exhibit R9." Walter Onnoghen, the suspended Chief Justice of Nigeria (CJN), says some money paid into his account sometime in 2015 were gifts for his daughter’s wedding, and not bribe as alleged by the Economic and Financial Crimes Commission (EFCC). 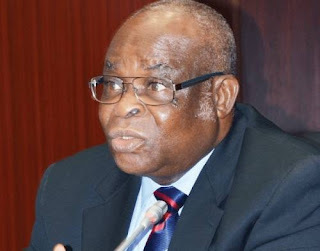 In a petition filed before the National Judicial Council (NJC), at its sitting on Wednesday, EFCC had alleged that Onnoghen received money in his account in 2015, alleging that the money was paid to influence the cases before the Supreme Court, at the time Onnoghen was on the Supreme Court panel. However, in a written address submitted by the counsel to the respondent listed as follows R.A. Lawal-Rabana, SAN; Okon Nkanu Efut, SAN; J.U.K. Igwe, SAN; George Ibrahim, Esq; Victoria Agi, Esq; Orji Ude Ekumankama, Esq; Opeyemi Origunloye, Esq; Temitayo Fiki, Esq, which was scheduled for Service on Rotimi Oyedepo, the counsel to the EFCC, Onnoghen denied the allegation, stating that the money constituted gifts for his daughter’s wedding, in line with custom. “In his evidence-In-Chief, the Respondent explained that the gifts were made at a time of the marriage ceremony of his first daughter, Oremini Nkanu Onnoghen who got married sometime in 2015. It was not solicited and remains a part and parcel of the customs and traditions of the people. His Lordship tendered a copy of the wedding invitation which was admitted in evidence without objection by the petitioner as Exhibit R9. “The Panel will observe that all the gifts of N250,000, N350,000, N250,000, N300,000 and N100,000 respectively were made within the period of the wedding shown in exhibit R9. From the evidence of the petitioner/prosecution itself, there were no other payments made by those persons or by any other lawyer into the account of the Respondent prior to or after the said period of the wedding of the daughter. “Accordingly, no misconduct can be seen or inferred from the unsolicited customary gifts said to be given to His Lordship. It had nothing to do with the discharge of his duties as a judicial offer. By Rule 13.5(2) of the Revised Code of Conduct For Judicial officers (Published February, 2016) a judicial office is permitted to accept – (i) Personal gifts or benefits from relatives or personal friends to such extent and on such occasions as are recognized by custom.